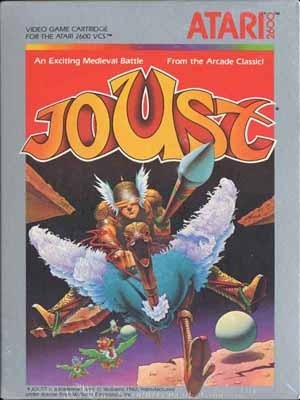 Joust is an arcade game developed by Williams Electronics and released in 1982. It is a platform game that features two-dimensional (2D) graphics. The player uses a button and joystick to control a knight riding a flying ostrich. The object is to progress through levels by defeating groups of enemy knights riding buzzards. John Newcomer led the development team, which included Bill Pfutzenrueter, Jan Hendricks, Python Anghelo, Tim Murphy, and John Kotlarik. Newcomer aimed to create a flying game with co-operative two-player gameplay, but wanted to avoid a space theme, which was popular at the time. Staff worked within the technical limitations of the hardware (originally developed two years earlier for Williams' first game, Defender), excluding concepts and optimizing the visuals. oust is a platforming game where the player controls a yellow knight riding a flying ostrich from a third-person perspective. Using the two-way directional joystick and the button for flapping the ostrich's wings, the player flies the knight amidst the floating rock platforms and above pools of lava; when maneuvering off the screen to either side, the player will continue its path reappearing from the opposite side. The rate at which the player repeatedly presses the button causes the ostrich to fly upward, hover, or slowly descend. The objective is to defeat groups of enemy knights riding buzzards that populate each level, referred to as a "wave". Upon completing a wave, a subsequent more-challenging wave will begin. Players navigate the knight to collide with enemies. The elevation of an enemy in relation to the player's knight determines the outcome of the collision. If the protagonist is higher than the enemy, the villain is defeated and vice versa. A collision of equal elevations results in the two knights bouncing off each other. A defeated enemy will turn into an egg that falls toward the bottom of the screen, which a player can collect for points. An egg that sits on a platform long enough will hatch into a new knight; if the player does not pick him up, he will gain a new mount and must be defeated again. The game features three types of enemy knights—Bounder, Hunter, and Shadow Lord—that are worth different amounts of points. A pterodactyl will appear after a predetermined time frame to hunt the hero. john McAllister holds the world record of 107 million points, set in 2010. Christian Gingras reached 98 million points in 1983, and held the record for some time. Lon McDonald reached 99.9 million in the spring of 2013. Between 2011 and 2013, McDonald also played as many Joust machines as he could locate across the U.S., playing to 10 million points each game, in order to reach 1 billion total points. In the spring of 2013 he completed this tour with his 100th game at the old Williams headquarters at 3401 N. California Ave. in Chicago. People in attendance included Roger Sharpe, Walter Day, and John Newcomer. A small reunion the night before gathered 3 members of the original development team: Newcomer, Python Anghelo, and Bill "Pfutz" Pfutzenreuter.